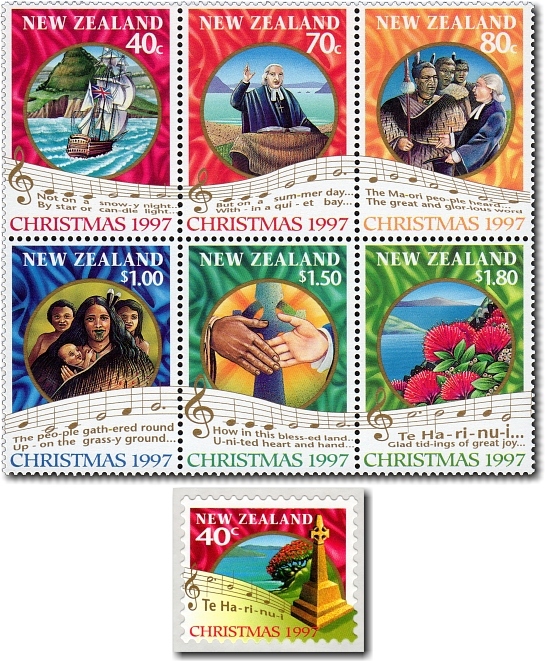 The 1997 Christmas issue features lyrics from the New Zealand Christmas Carol 'Te Harinui' written forty years earlier by Willow Macky in 1957 to commemorate the first Christmas Day service in New Zealand held by the Reverend Samuel Marsden at the Bay of Islands on Christmas Day 1814. This service was first commemorated in the 1964 Christmas issue. The lyrics 'now in' were incorrectly transcribed as 'how in' on the $1.50 stamp and this error was never rectified.